The Triangle Shirtwaist Factory fire in New York City in 1911 inspired a wave of workplace safety reforms in the US. Bangladesh is now trying to do the same. A blaze recently swept through a high-rise office tower in Dhaka, claiming at least 25 lives. Six people perished when they jumped to escape the flames at the FR Tower. Authorities have filed criminal charges against the building’s owner, who had added four illegal floors to the tower. Including a video that showed chaos on the street as the fire raged, the New York Times reported that some workers used telephone and Internet cables to climb down to safety. At least one succeeded, others fell in mid-attempt. The conflagration revived memories of the 2013 collapse of the eight-story Rana Plaza building outside Dhaka, which killed more than 1,100 garment workers. That disaster shined a light on the poor conditions of textile enterprises that service American and European clothing brands. Rana Plaza was poorly constructed, wrote NPR. After Rana Plaza, Bangladeshi officials vowed to implement a raft of safety measures to prevent future tragedies. But the FR Tower fire showed they didn’t make good on their promises. “Once again, we were ill-prepared,” was the headline in the Dhaka Tribune, a local English-language newspaper. The FR Tower – variously described as 22 or 24 stories tall – contained no sprinklers, had few fire extinguishers, and its emergency exits were too narrow, Al Jazeera reported. The building’s managers also didn’t conduct fire drills. Those problems comported with a 2012 study that found that only two office buildings in the city were fully compliant with safety regulations, Agence France-Presse reported. Officials have kept their heads in the sand despite a series of tragedies. In 2010, a fire in Dhaka’s densely populated Nimtoli district killed 123 people. In 2012, a garment factory fire killed 111 workers. Improperly stored chemicals fueled a February fire that killed at least 80 people. The national government pledged to shutter similar chemical factories after the fire. Out of 1,000 such factories in the city, around 850 were illegal, an environmental group said. City officials had made a similar pledge nine years ago after a blaze killed 120, noted the Guardian. Greed is the problem, said observers. 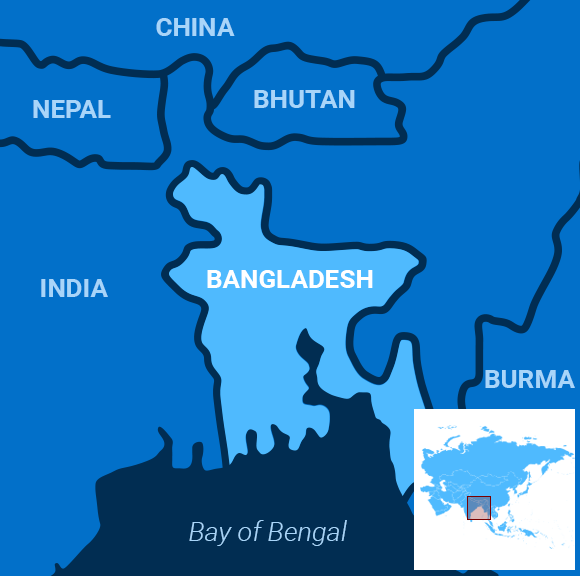 Bangladesh’s economy has grown by more than 6 percent annually in the last decade, but regulations have not kept up with the expansion, the Associated Press wrote. When rules might have saved lives if they had been enforced, politically connected landlords flouted them. Others bribed corrupt officials to look the other way. The same stuff used to happen in the US. People got angry and changed things. Bangladesh’s leaders should beware. The Libyan military commander vying to unseat the United Nations-backed government has ordered his Libya National Army to march on Tripoli, raising fears of an escalation of fighting in the North African country that has been in turmoil since the killing of former leader Muammar Gaddafi in 2011. Field Marshal Khalifa Haftar, whose Libya National Army controls the eastern two-thirds of the country, said his troops’ “victorious march” on Tripoli would “shake the lands under the feet of the unjust bunch,” the UK’s Guardian newspaper reported. With the backing of Egypt, the United Arab Emirates and France, Haftar has seized territory across the southern part of the country in recent weeks. In response to Haftar’s statement, the UN-backed Fayez al-Sarraj vowed, “We are prepared to respond to any threats aimed at undermining security in any part of our country. Belgian Prime Minister Charles Michel officially apologized for his country’s kidnapping of thousands of children born to mixed-race couples during colonial rule in Burundi, the Democratic Republic of Congo and Rwanda. Michel acknowledged that the government took around 20,000 children from their mothers as part of the program, violating their basic human rights, stripping them of their identity, stigmatizing them and separating them from their siblings, the BBC reported. “I vow that this solemn moment will represent a further step toward awareness and recognition of this part of our national history,” he said in a statement. Born in the 1940s and 1950s, the children were taken from the former colonies to Belgium in 1959, yet some of them never received Belgian citizenship. Many have no birth records and have thus been unable to track down their birth mothers or their Belgian fathers. The government of Brazil’s Jair Bolsonaro has rejected a call from the United Nations to clarify the country’s past, rejecting that the 1964 takeover of the government by the military was a coup d’etat. In a letter to the UN human rights commission in Geneva made public on Thursday, Brazil repudiated “the baseless accusations” that Bolsonaro was attempting to downplay rights violations, Reuters reported. On Sunday, Brazil’s armed forces celebrated the 1964 coup that led to a two-decade military dictatorship, following Bolsonaro’s decision to scrap an eight-year ban on such festivities. The dictatorship executed hundreds, tortured thousands and shut down the Congress even as Bolsonaro appears to look back at the period with nostalgia, critics charge. Neuroscientists have long debated whether the human brain continues producing new brain cells in adulthood – a process known as neurogenesis. A recent study may settle the debate. Its authors found that the adult brain is capable of producing new neurons, although at a slower rate as it ages, the Guardian reported. Researchers in Spain studied the brains of 58 deceased donors aged 43 to 97 years old, and discovered the presence of new cells around the hippocampus – which handles memory and emotions. In the brains of donors who were neurologically healthy when they died, the researchers noted that between the ages of 40 and 70, the number of fresh neurons fell from about 40,000 to 30,000 per cubic millimeter. The figure was sharply lower for people who had been diagnosed with Alzheimer’s disease. “The number of cells you detect in healthy subjects is always higher than the number detected in Alzheimer’s disease patients, regardless of their age,” said lead author María Llorens-Martín. The study may resolve the debate about neurogenesis, but also offer new solutions in fighting Alzheimer’s. Currently, the disease remains incurable but Llorens-Martin is hopeful that the study can help in catching Alzheimer’s in its early stages. Moreover, the study also proves that one can teach an old dog new tricks – it just takes more time and effort.